Worldwide network nearing one thousand installations across united states as expansion into international locations gets underway. Real Digital Media, provider of the enterprise-class NEOCAST® digital signage platform, and Independent Purchasing Cooperative, Inc. (IPC) the independent SUBWAY® franchisee-owned purchasing cooperative, today announced expansion details for the SUBWAY®TV & RADIO digital signage network. 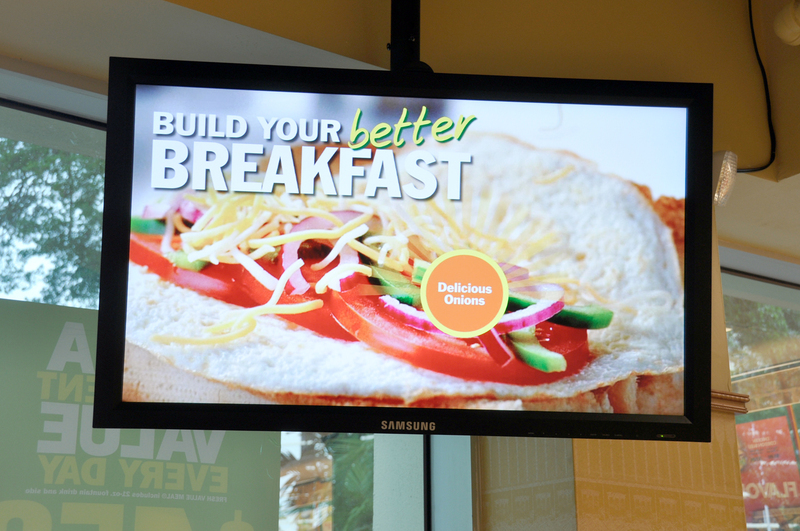 Designed to enhance the SUBWAY® customer experience worldwide, the SUBWAY®TV & RADIO digital signage program aims to better inform customers of their food and drink options, introduce new menu items and enhance the visibility of in-store promotions. The program is an elegantly designed marketing and sales vehicle streamlined to fit within the daily operations of franchisees’ restaurants. The network has been expanding rapidly since it was launched in 2010. Approximately 1,000 installations have already been deployed in the United States, with over 500 installations in the Los Angeles market area alone with plans underway to soon expand into international markets. Programming content is supplied and managed at a national level, but unique to SUBWAY® TV & RADIO, franchisees can influence what is played by logging on and scheduling changes through a franchisee portal. The network allows for local control of playlists across several time slots, such as breakfast, lunch or dinner. Fully integrated with the NEOCAST® Media Server management software, this new web-based application is called NEOCAST® Director. It allows network operators to centrally identify media that is accessible to local users, who can then simply select, schedule and place those media into already active playlists in their restaurant locations. Michael Baron, President of Real Digital Media added, "Subway is a highly engaged partner and pushes us to enhance our product to meet the unique demands of their franchisees. They are totally focused on digital signage as a way to enhance their stellar brand, improve already industry leading customer satisfaction and make franchisees even more profitable. As the SUBWAY®TV & RADIO Network moves to quickly become the largest global digital signage network, we are pleased that we can be an integral part of the Subway family and help them achieve even greater success in the years ahead." The SUBWAY®TV & RADIO Network operates on the NEOCAST® digital signage platform from Real Digital Media. Key factors for the selection of NEOCAST® include having an enterprise version that could scale to serve multiple media players in each of the more than 36,000 SUBWAY® locations worldwide; the ability to stream music programming through a media player that also handles the video programming; and the flexibility to quickly develop new features required by the IPC network operators around the globe and the franchisees themselves. The SUBWAY® restaurant chain is the world's largest submarine sandwich franchise, with more than 36,000 locations in 98 countries. Headquartered in Milford, Connecticut, and with regional offices in Amsterdam, Beirut, Brisbane, Miami, and Singapore, the SUBWAY® chain was co-founded by Fred DeLuca and Dr. Peter Buck in 1965. For more information about the SUBWAY® restaurant chain please visit http://www.SUBWAY.com and http://www.SUBWAYfreshbuzz.com. SUBWAY® is a registered trademark of Doctor's Associates Inc. Founded in 1992 and publicly traded in Taiwan, NEXCOM is dedicated to enhancing the value of its customers' businesses through customized solutions and state-of-the-art digital signage technology. NEXCOM, an ISO-9001 certified company and member of Intel® Embedded Alliance, continues to develop digital signage products incorporating the latest technology and works closely with global partners to fulfill customer requirements. A wide range from cost-effective to superior high-performance and feature-rich digital signage solutions are created to address the broad spectrum of specific multi-media applications. The fan-less and compact design also provides great reliability, low maintenance and easy integration behind displays or other areas with limited space.